This morning I was "volunteered", as I always seem to be, to go down to the chicken paddock and the other pens we have here at FSF HQ, on the morning egg collection. Grumbling, mumbling and generally bumbling, I pulled my boots on, put an extra two or three layers on and went out into the morning cold. Finding myself in tow to resident chicken whisperer Rob, our first port of call were the Gold Laced Sebright's in their Aviary 8 Hen House, past the family of Silver Spangled Hamburgs who live in the Maggie's 6 and Protection Pen right outside our shop front door (who considering the early hour of the morning hadn't bothered to get up yet) and down to the chicken paddock. While the various flocks of hens, ducks and geese enthusiastically thronged around Rob, well known as the supplier of breakfast, I was left to egg collecting duties. Spring must be in the air, because the sheer volume of eggs we brought back from this one trip will be keeping us in omelettes for a week. With shades from light bluish hues to deep ochre browns, the pile of eggs accumulated higher and higher. 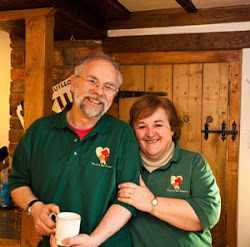 While everyone here at FSF HQ is quite happy with eating omelettes five times a day until the end of the summer, when your chickens start laying a prodigious amount of eggs you might find yourself looking to sell the excess by your front gate, give some as presents, or perhaps you might know someone in dire need of some egg boxes themselves to house their supply. At Flyte so Fancy we have a huge and varied range of egg boxes, from Quail Egg Boxes for the small bird enthusiast, egg boxes designed to hold an egg a day and egg boxes every colour of the rainbow (well very nearly). From Small Packs of 30 Egg Boxes and Four-Egg Egg Boxes, perfect for the back garden poultry keeper with a few eggs going spare, right the way up to packs of 300 Economy Grey Egg Boxes (perfect for people with over zealous hens) there is an egg box solution for everyone. My personal favourite, and the ones which I think really highlight the extraordinary colours, shades and hues of eggs are the Coloured Fibre Egg Boxes, in particular, the Yellow Egg Boxes and our most popular Pink Egg Boxes. Both the Yellow Fibre Egg Boxes and the Pink Fibre Egg Boxes are perfectly eye catching and guaranteed to be noticed. Made of strong quality fibre, these egg boxes are ideal for your eggs, but we also have customers who use them for selling bath bombs (in Harrod's no less), chocolates and perhaps most strangely, socks. Of course the ultimate way to really make your eggs stand out in the crowd is to add some of our exclusive Egg Box Labels, available in either white or clotted cream. Simply choose the design, style and text that you want, stick to the top of your egg box and watch them fly off the shelves quicker than hot cakes. Loading up the wheelbarrow with my yolk filled treasure and leaving Rob behind with his cohort of chickens, I returned to the comforting embrace of my office chair and a cup of coffee. Sitting and staring out of the window for a few minutes at the chickens, ducks and geese as they trailed Rob around the field, I was "volunteered" again to wash the huge mound of eggs I had collected (see our previous Blog about Egg Washing) as I "seemed to have quite enough time for daydreaming". I told you I always get "volunteered". Depending on their gender, members of the Flyte so Fancy Office team this week are suffering from either the "man flu" or a "proper cold". As the last one left to avoid the lurgy, thanks to some superior sneeze and cough dodging skills, I decided to get out of the office with my laptop and find somewhere a little safer from the onslaught of runny noses and the intoxicating smells of blackcurrant Soothers. My laptop and I consequently set up shop in the feed store. Fashioning a desk and chair from some bags of Garvo Alfamix, making sure my thermos was well stocked with coffee (and after considering its surroundings) the FSF Blog's attention turns towards poultry feeds. We all know the treats and delectable's that our chickens go mad for, and they certainly have their place to help prevent bullying, feather pecking and boredom, but when it comes to the everyday staple diet, making sure your chickens are getting a nutritious and filling feed is important. A good poultry feeder, whether it's plastic, galvanised, designed to keep the weather off or for ease of use, having a good strong feeder, able to survive the quirks of British weather, is essential. A good quality feeder will also cut down on issues like wastage from your girls throwing their feed around, also reducing the risk of attracting vermin. Similarly a galvanised feed bin (like the one I'm currently using as a stand for my coffee) is a great way to safely store your feed from mice and to keep it fresh. A chickens basic feed is a layers pellets. An average hen, will eat around 150g of feed a day, depending on what other sources of food there are available. Layers Pellets should be provided on a free access basis, and whether you go for the organic option or not, they will provide an all round complete feed for your girls. 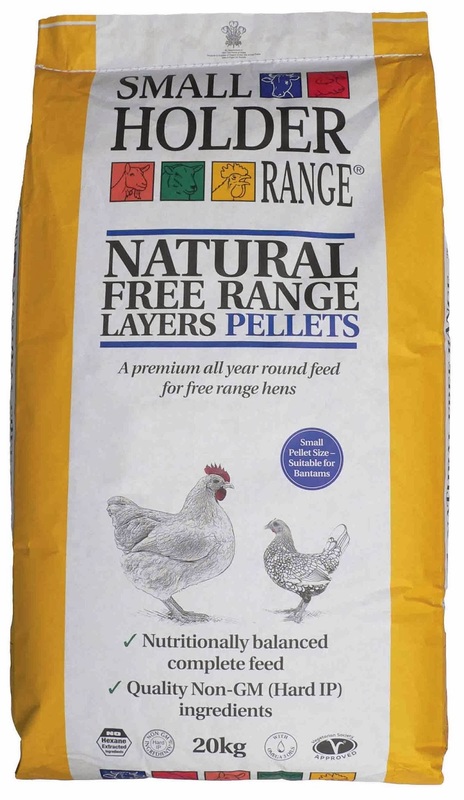 The Smallholder Free Range Layers Pellets that we offer are a great source of Omega 3, a vital ingredient in happy hens and hearty eggs. Omega 3 is just as important to keeping chickens healthy as it is humans, and eggs are a great source of this essential vitamin for people. It also uses linseed as a source as opposed to fish meal, which other feeds do, so no slightly fishy tasting eggs. Here at FSF we suggest throwing a handful of Mixed Corn down for your hens in the afternoon too. If you leave it on display or mix it in with the layers pellets, you will probably find that your hens ignore everything else but the tasty treats, throwing the unwanted feed out of the feeder and creating a mess. A mix of wheat, barley, maize, peas, oyster shell and grit, it has a little bit of everything that a chicken needs to give them a well balanced diet, when used in conjunction with a layers pellets. An interesting note, make sure you choose a mixed corn that doesn't have too much maize in it. Maize is excellent in the winter for providing chickens with plenty of much needed energy, but too much in the summer can make them put on weight, reduce egg production and make them hyperactive which can lead to bullying through feather pecking. From my view point up here on top of my Alfamix chair, the full range of poultry feeds are laid out in front of me. From Baby Chick Crumb and Growers Pellets for the poultry breeder, the Organic feed range and the widely respected Garvo feeds. When it comes to feeds, avoid the cheaper option, they are often of a poorer quality, nutritiously poor and can adversely affect the health of your flock. Having been hustled from my seat by a busy despatch team looking to pack parcels, I headed for the egg box store. Until I get the all clear that the contagion has passed, here I shall remain, perched on a throne built from egg boxes, quietly working away. There isn't really the time or space here to discuss all the merits and advantages of the all the available and different feeds, but if you have a question about what would be the best feed for your chickens, why not leave a comment or give us a call on 01300 345229. A long time ago, before I was seduced by the office with its offers of coffee brought to you and comfy chairs, this humble blogger was a member of the despatch department. Throughout cold winters, wet winters and frankly abominable winters, I shivered my way back and forth outside, with very little sympathy, sending out our lovely chicken coops and wide range of poultry supplies up and down our little island. One of the more popular items that our customers go for during the winter are Protection Pen Roofs. 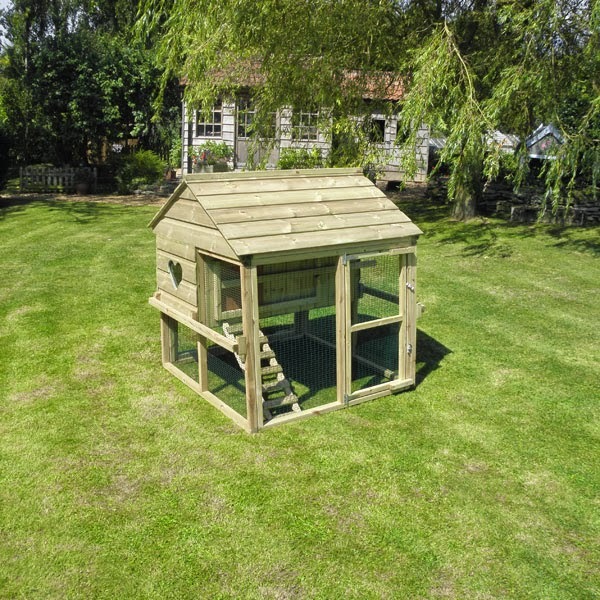 The Flyte so Fancy Poultry Protection Pen is a lightweight structure, popular with many of our customers as a secure chicken run, for keeping out predators, contaminants and wild bird populations, but also especially great for letting your girls roam securely if you're out during the day. Having built a fair share of Protection Pens in my time, they are very simple to put together, merely a case of screwing the flat pack panels together and by the the time you have put the last braces in, you are left with a light and airy, but incredibly sturdy chicken run for your feathered friends, designed to be stable in all this bad weather. Our Protection Pens are made from 38mm x 38mm pressure treated timber for the frames, and completely wired in inch by half inch plastic-coated galvanised weldmesh. Onto this rigid framework is the option to add the Polycarbonate Roofing. We have avoided using PVC sheets as they are too easily ripped off, polytunnels get too hot in summer, plywood is too heavy and we think Onduline is just too dark altogether. A solid transparent UV stable barrier, the polycarbonate roofing is a great addition. Fixed to the mesh panels of the roof, carefully via polypins (it can be removed at a later date if wished) with the included tube of silicone you can fill in between the panels, providing the most secure roof possible. If the roof is ordered at the same time as the chicken run, then we will attach them for you ready to go, however they are extremely easy to add at a later date. There are several advantages to the Protection Pen roofing. 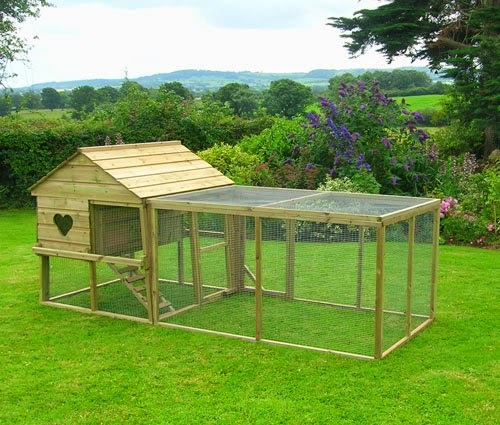 Firstly, with the biblical levels of rain falling this winter, providing a dry area in your run will be much appreciated by your chickens looking for somewhere to stay out of the weather. It will also help keep the ground of the run drier too and help prevent an inevitable mud bath, more suited for hippos than chickens. The inch by half inch size of the weldmesh stops wild birds getting into the run, but the roof also provides a solid barrier that will stop wild birds contaminating your feeders and drinkers when they fly above, always a bonus. Considering the vagaries of the British climate and reminding you that the Protection Pen is a lightweight structure, we advise that you should not allow heavy snow to accumulate on the roof. This weight can severely compromise the structural integrity of the protection pen. Of course you don't need to cover the whole of the roof of your pen either. 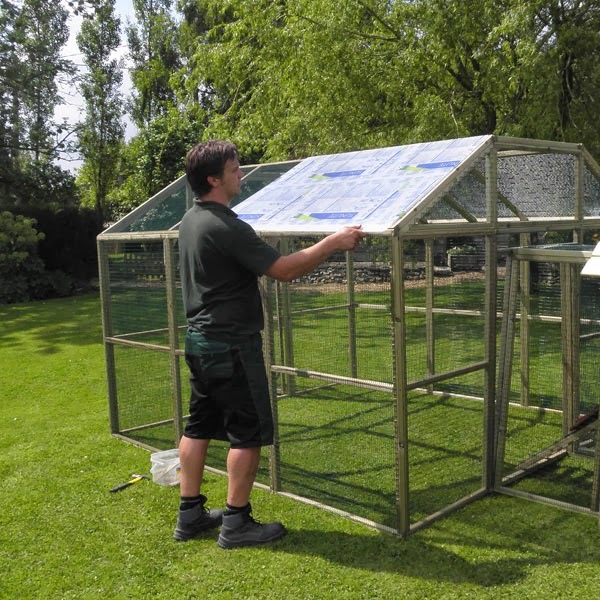 Whether its just a corner or perhaps half the unit, the advantages of a polycarbonate roof are incredibly beneficial and useful to chicken keepers. So, while I might look back at my years in the howling wind and lashing rain from the warm comfort of an ergonomic office chair with shallow regret, the Protection Pen and it's protective roof is always something I would recommend for these cold, wet British winters.